Jirayr Zorthian was born in Turkish Armenia in 1911. As such, he was fortuitously positioned to experience the Armenian Genocide, which followed soon after. He and his immediate family, although psychically scarred, miraculously survived the experience. They immigrated to the United States in 1922 settling in New Haven, Connecticut. Jirayr, the oldest sibling of three boys, was clearly talented as an artist and his parents encouraged him to develop this ability at an early age. His capacity flourished through his teenage years until he was granted a full college scholarship to the Yale School of fine arts. Following his graduation from Yale he was granted a fellowship to study abroad and he traveled around Europe and North Africa for several years in the 1930s, studying art, architecture and experiencing the rise of fascism in Italy, Germany and Spain. He returned to participate in Franklin Roosevelt’s WPA projects for artists, becoming a muralist of some note. A number of his murals survive to this day in State capitals and in Post offices on the East Coast and in the south. 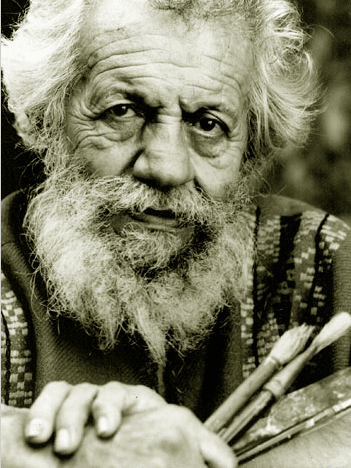 During World War II Jirayr was inducted into the U.S. army where he produced propaganda posters for the war effort and a 157-foot long mural for the pentagon, which he considered to be his crowning achievement as a fine artist. Following the war Jirayr and his first wife, Betty Williams, came to the Los Angeles area where they purchased 27 acres in the foothills of Altadena. Jirayr began the process of building structures on the property and began to pour more of his energy into creating architecture from materials that were discarded by builders and local municipalities. Jirayr received the property as part of his divorce settlement from his first wife in 1954. Several years later he married his second wife Dabney and they purchased 21 more acres below the upper property. This brought the total acreage owned by the Zorthians to 48 acres. Jirayr and Dabney Zorthian also ran a summer camp for children at the ranch, for over 25 years. Over time Jirayr created a number of different buildings and assembly spaces which reflect the unique esthetic that he developed; building with concrete, river rock, broken concrete and telephone poles. Beyond his talent as an artist, Jirayr was intensely social and had a wide and diverse circle of friends. The Zorthian ranch was the site of many parties and other events including jazz performances, retreats, and movie shoots. Jirayr died January 6, 2004 at 92 years old after having spent the past 57 years working on his ranch. His wife Dabney died 2 years later. He is survived by his children Barry, Seyburn, Toby, Alan and Alice. His son Alan is living on the property.